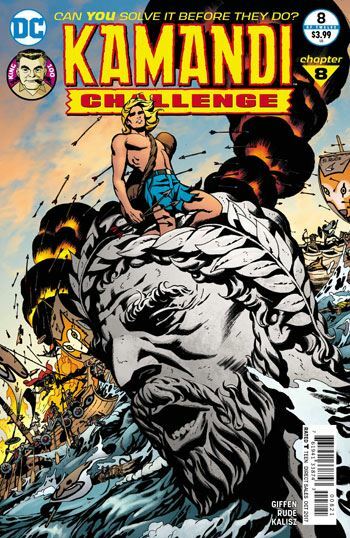 Kamandi Challenge 8 feels like something straight out of Gulliver’s Travels. And there’s a reason for that. Because it sort of is. 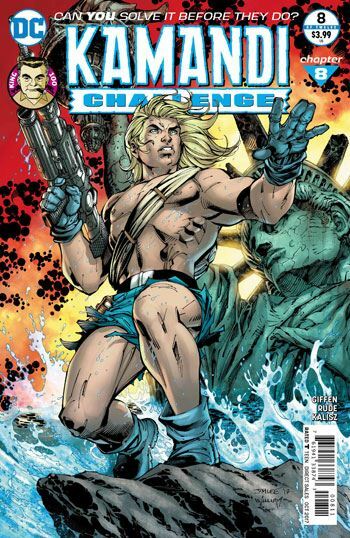 Keith Giffen spends very little time getting Kamandi out of the predicament he was placed into at the end of the last issue, and focuses almost this entire issue on a war between goats and sheep. The two species each have built their religion around copies of the Iliad, but they are working off of different translations. One renders the hero’s name as Odysseus, and the other as Ulysses. Kamandi, poor kid, descends into the middle of this, and is taken by both to be their god returned. Because this is scripted by Giffen, the dialogue is clever and snappy, and the issue is breezy and fun. Steve Rude does a very good job with the art, which has a bit more of a Kirby flavour than many of the issues. There is one touch that feels odd, given the earlier issues, a page that visually recaps a number of adventures from the original comic. By and large, this series has presented a story completely independent of that one, right down to the way Renzi was used and introduced. The flashback page in this issue is difficult to reconcile with this, but I suppose such problems could be expected when a different creative team executes each chapter.